I guess if you are going to build a robot to do something boring like telepresence, you might as well make it cute. That’s obviously what [Andrew Maurer] was thinking when he built a telepresence robot using a Wall-E toy. The result is kind of adorable: Wall-E is holding the 5-inch HDMI screen that shows the video, and can scoot around in true Pixar fashion under remote control. It’s also a neat build on the inside, using a Raspberry Pi for the brains and an Adafruit MotorHat to control the motors. The original toy didn’t have motors, so he added a new RC gearbox and motors to drive the little fella around. Installed behind Wall-Es eye is a USB webcam. Running behind the scenes is a mumble server that does the audio, a copy of Chromium that shows the video, and an Apache server that feeds the captured video to the other end of the conversation. The whole thing is tied together by a few scripts that kick things off appropriately and allow the user to remotely control Wall-E. It’s a cute build, and hopefully Wall-E can still find his EVE while performing his new corporate duties. [Dino’s] latest Hack a Week project, the WALL-E Robot shows quite simply what you can create from a few dollars worth of toys from garage sales and cheap stores. When he found the WALL-E toy at a garage sale, Dino decided that he had to give it a brain. 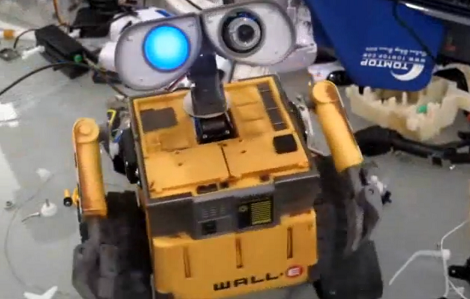 Using the geared motors from some Rumble Robots, the H-bridges from some $5 remote control cars (after his own H-bridges cooked themselves), an ultrasonic sensor and an Arduino, WALL-E was brought to life. The WALL-E Robot might not be the brightest bot, or the most stable, but the project definitely demonstrates some effective scrounging for parts that would have done WALL-E proud. It also shows how even the most simple projects can cause the most headaches when they don’t go right. 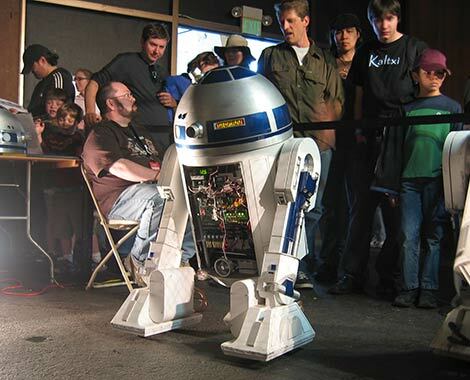 Check out the video after the break for the build details, a demonstration and to see a man talk to a toy robot. [Totoro] sent in this cool little email notification device he made. Using a paper model of Wall-E, he added some servos and connected it to his computer using a PIC. Mail-E has independent arm rotation and head rotation. He admits that the PIC processor is major overkill and plans some upgrades such as making it wireless and using a little better suited chip to control it. Not bad for a proof of concept.